Historic Main Street, Oldham County, Ky.
Oldham County, Kentucky is located on Interstate 71, just 20 minutes from downtown Louisville, 60 minutes from Cincinnati, Ohio, and 70 minutes from Kentuckys new Ark Encounter and Creation Museum. Only in Oldham will you find tastes and tours of all things Kentucky  all in one place  and all with one itinerary payment after accommodations. Group tour planning assistance is complimentary with all Oldham overnight stays in hotels and home rentals. Oldham Farm Tours, Oldham, Ky.
Come touch the memories from April to October. Known as the Farm Tour Capital of Kentucky, Oldham offers 15 educational, hands-on tours where touching is not only allowed  its encouraged! 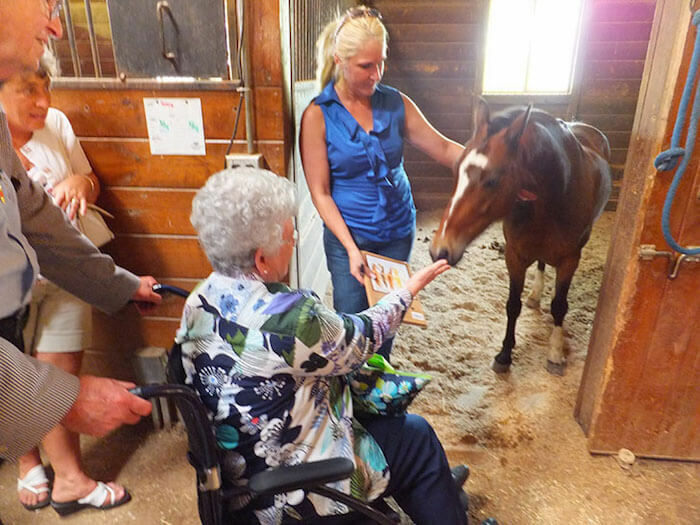 Horses, bison, alpaca with art studios, sheep, a working dairy, nature preserves & botanical gardens, heirlooms and organics, cooking classes and scenic hayrides overlooking the Ohio River make Oldham Farm Tours unforgettable. It’s great when paired with our grain-to-bottle distillery tour and gorgeous beer garden in greenhouses! Kentucky Artisan Distillery, Crestwood, Ky.
Oldham KY Tourism offers private, behind-the-scenes tours of Kentucky Artisan Distillery that are as uncommon as the bourbons themselves. 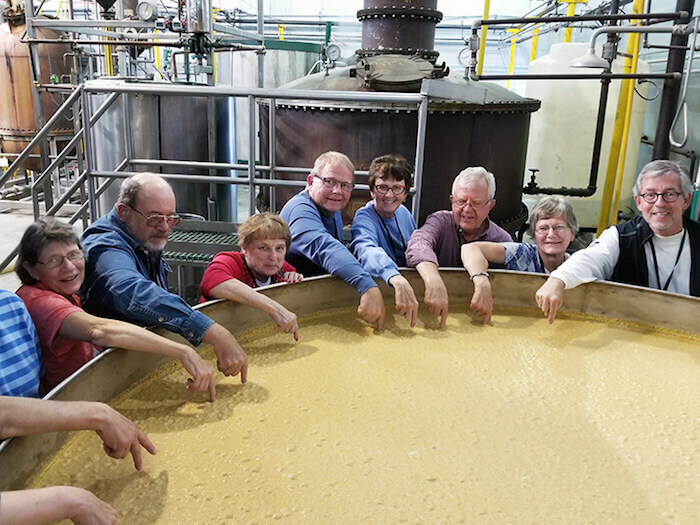 Home to three high-end bourbons  Jeffersons, Highspire Rye and Whiskey Row  groups learn the art of craft bourbon-making at this popular stop on the Kentucky Bourbon Trail Craft Tour, complete with bourbon tastings and a bourbon-themed Kentucky comfort foods dinner on the deck. We handle all the details while you sit back and relax! Peyton Samuel Head Museum, Oldham County, Ky.
Two of only nine Kentucky Underground Railroad Designations are in Oldham! The Henry Bibb Escapes and J.C. Barnett Archives received designations from the National Park Service in 2016. 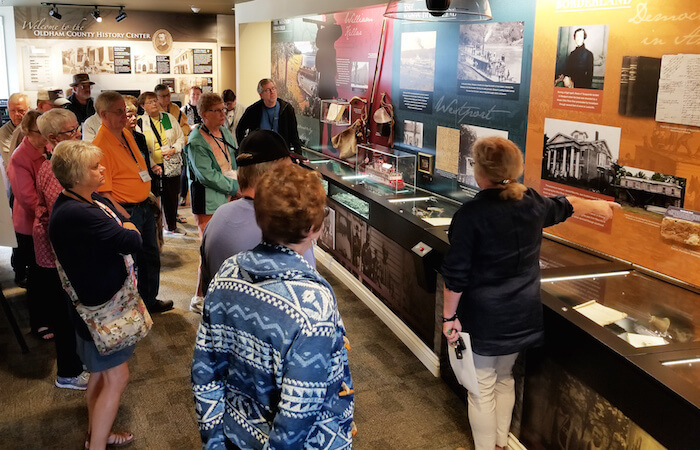 Dr. Nancy Theiss teaches about the Underground Railroad during a lunch and tour of the Peyton Samuel Head Museum, on Ohio River dinner cruises, downtown walks, cemetery tours and reenactments. Also learn about Rob Morris (Eastern Star), Annie Fellows Johnston (Little Colonel) and DW Griffith (Filmmaker). Trains on Main Street, La Grange, Ky.
Found in just one place in the U.S., it starts as a rumble. Then, the bells. Next, vibrations. Most first-time visitors to historic downtown La Grange are astounded as they watch a CSX freight train roll slowly down the center of their very walkable Main Street. Experience trains on Main as you meander through unique shops, used bookstores, galleries, candy shops, art studios, coffee shops and restaurants with outdoor seating by the tracks.